It’s that time of year again—soccer season! 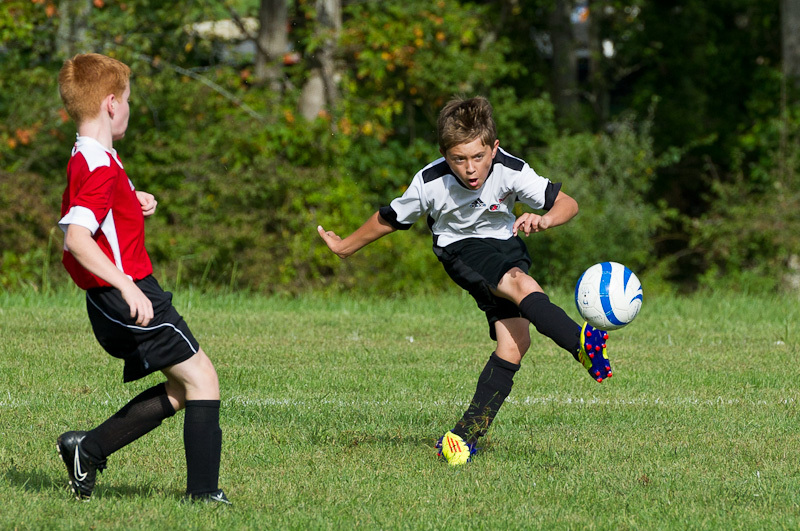 Cameron and his pal Robbie were drafted onto a new Suburban Friendship League team this fall called the Loudoun Lads. Based in Purcellville, practices are now only a 25-minute drive away versus the 50 minutes we endured last year. With Hurricane Irene and the remnants of Tropical Storm Lee drenching the fields, practices have been few and far between so far, and the team’s first game was a wash-out. Today, the Lads finally got a sunny day and onto the field for game. Although they played hard, their opponents, the Vipers, were a tough group and ended up with the victory. Cameron, who played goalie much of last season, enjoyed moving up to the front line. In addition to an assist, he had six or seven shots on goal, but the Vipers’ talented goalie kept Cam from getting one into the net. Nevertheless, it was a successful day, the new coaches learned a lot about the players strengths and weaknesses, and we all look forward to another sunny day next Saturday. Great photo, Tricia! Unfortunate that the weather prevented practices, but the slow start can be turned around rapidly. I hope they have a successful and fun season! Great photo!! He is certainly focused! !